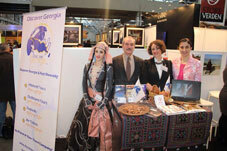 Georgia participates in the international tourist exhibition „FITOUR 2014"
25.01.2014. From January 22, 24 to January 26 National Tourism Administration of Georgia participates in the international tourism exhibition-fair „FITUR 2014" in Madrid, Spain. Ministry of Economy and Sustainable Development informs that the exhibition is one of the large-scale ones in the world, 10 644 companies of 166 countries participate in it. 7 532 journalists attend it and it has about 124 700 visitors. Georgia participates in this exhibition for the 7th year. In addition to National Tourism Administration, stand of Georgia will also include following companies: Visit Georgia, Georgica Travel, Georgian Discovery Tours, Caucasus Travel and Concord Travel. Spain is one of the target tourism markets for Georgia. According to statistic, from 2013 to 2013 (data of 11 months 2013) number of tourists increased by 26% from Spain. 03.01.2014. A new winter resort is expected to be opened by 2016 in Georgia’s mountainous region of Svaneti. The resort, worth 40 million and co-financed by the French government, will be located on Tetnuldi, a prominent mountain peak situated in the central part of the Greater Caucasus Mountain Range, in Svaneti. GEL 40 million will be allocated for this from the Georgian state. Construction of the ski resort “Tetnuldi” is planned to be finished by 2016. At this stage, according to the agreement between the state and Pomagalski company, the French partners should provide the project with 3 rope-ways, according to the Ministry of Regional Development and Infrastructure of Georgia. The French Government allocated EUR 18 million for this project as a loan to the Georgian Government. From the Georgian side GEL 40 million will be allocated for this project in the future. With 100% participation from the Government’s side the Tetnuldi Development company was created to supervise the development of the Tetnuldi project. The main mission of this company consists of implementing the design and construction works. At this stage there are design works in progress, which are being carried out by Ltd Geographic ordered by Tetnuldi Development. After the works will be finished an international tender will be announced for principal construction works, according to the Ministry of Regional Development and Infrastructure of Georgia.